Cuphead fights an evil carrot and potato. 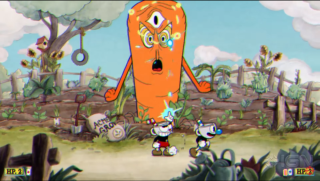 Allotments are evil, a fact confirmed by Cuphead's latest blast of footage (via IGN), which features a boss fight against a nasty carrot and a jerk potato. It also shows off a bit of that newly revealed platforming—and thank heavens that's in there, as a simple boss rush doesn't interest me at all. The Microsoft-backed 1930s-cartoon-inspired platformer is due later this year sometime, and that vague non-date clearly isn't soon enough.